Asus MultiFrame is a small desktop utility which allows you to quick arrange windows into tiles. It can divide and organize your windows quickly and easily. 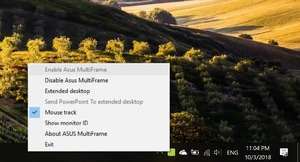 After installing the program, Asus MultiFrame can be accessed from the system tray. Once launched, it becomes an overlay which gives you the option to 'tile' windows into certain sections of the screen like top-right, top-left, center, etc. Version 1.1.1.1 is a freeware program which does not have restrictions and it's free so it doesn't cost anything. For security reasons, you should also check out the Asus MultiFrame download at LO4D.com which includes virus and malware tests. Additional screenshots of this application download may be available, too.